This revolutionary new 6 stage system uses Reverse Osmosis, Deionization and Carbon Filtration to put refreshing, clean water at your fingertips. No other system available anywhere can give you all three kinds of purification in a system that is so simple. Using reverse osmosis technologies with deionization can actually remove 99.99% of contaminants found in water and provide people with perfect drinking water. Only this combination of technologies can ensure absolute purity and produce highest quality pure water. Since we introduced the EC Series to our customers, the respond has been incredible success. 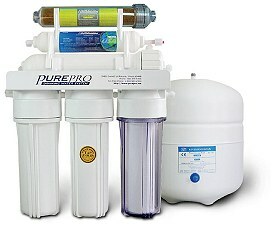 EC106DI provides safe, pure water using reverse osmosis technology. We don't know of any other system at our price that can approaches its performance. EC106DI comes complete with a NSF certified 3.2 gallons water storage tank, USA made membrane and all the necessary fittings, installation kits, extra color 1/4" tubing, and a long-reach chrome faucet.